I want this.... but have already spent some money on the discontinued Bushcraft which should be coming in tomorrow (Excited). I'm sorry if my Para 3 whorness skews my reports. I can be impartial. I'm working on it with help. There's absolutely nothing wrong with having different (sized) knives for different occasions and / or venues. Even as a retired LEO living in a semi-rural environment I try to consider the environment I intend to be in. When I'm going to a restaurant or the supermarket, there's no need for me to have anything larger than the Para 3 which is more than capable of handling any task at hand. We are ambassadors of the knife world and it's better for folks to see the utility and sense of carrying a pocketknife rather than causing undue alarm simply because we are within our rights. Sorry if this has already been covered, but what is the difference between smooth G10 and the G10 handles that come on the other models? Is it smooth/shiny like the fixed blade Junction, or is there some texture? My pre-order is now listed in my KC account. Most G10 used in knives has a so called Peel Ply texture. So it's a little rough to give grip. The G10 on this exclusive is as it says smooth, which is not the standard. You can still see the fiberglas pattern in the epoxy. My first pre-order with KC... and really hoping these aren't delayed from the expected date! Pretty excited to try the smooth G10 scales, and also happy that this version will have the satin grinds as opposed to the blasted finish in some of the sprints. 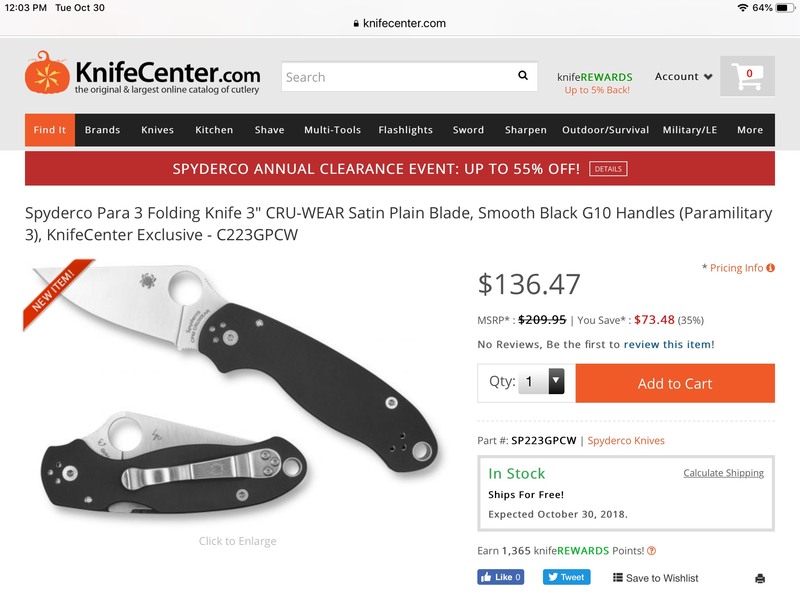 Looking at the close up picture of the handle above.. makes me wish Spyderco would put a nice big radius'ed edge around the scales to give it more "contour". Would definitely feel really nice in hand. 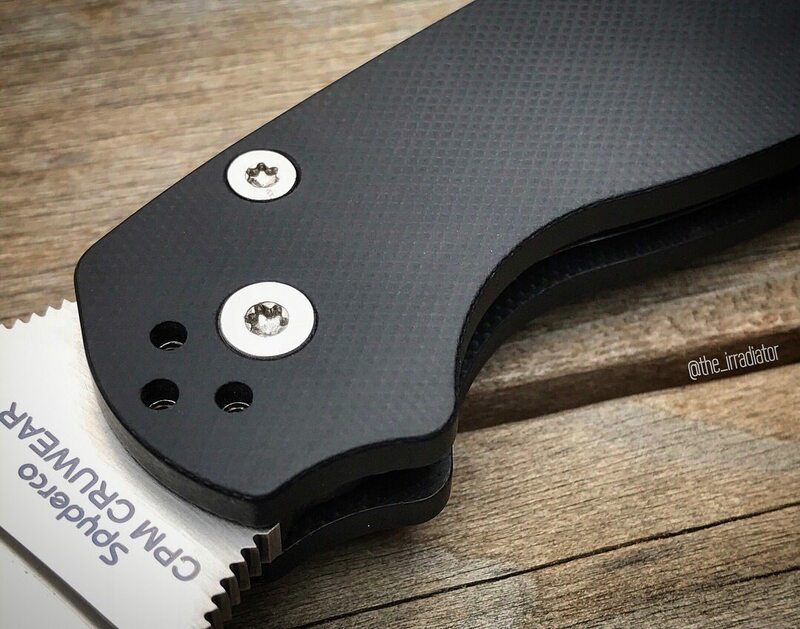 Looking at the close up picture of the handle above.. makes me wish Spyderco would put a nice big radius'ed edge around the scales to give it more "contour". Would definitely feel really nice in hand. That is a PM2 though. They have sharper/less rounded G10 edges than the Para 3's. Ok, I just saw that KC just charged my CC for it. Should be coming soon. Mine shows in stock as well. That’s so surprising to me! Seeing other recent Para 3 exclusives sell out so fast made me think this one also would. Let’s see if it can last the rest of the month! What models has Cru wear been offered on? Just called and it's shipping today. I had no idea these orders were being filled so quickly. Good stuff. I have to pass on this one as I have my eye on the Rex45 and BHQ mili. Also, the smooth scales are not my thing. They are not Shaman smooth, but a weird slick smooth. I’m normally not a big fan of “slick” surfaces either, but I decided this one gets a pass. It’s just a nice change from the textured surfaces found on most knives I own. Another huge reason I don’t mind it is the fact that I’ve never had to use a knife with wet hands. I find dry hands can still get plenty of grip, thankfully. I think the PM2, Millie, Manix 2 and this one. This is the second Para 3 in Cruwear. Not sure if KC got all 600 on day 1, but i can only add 32 to my cart before it goes out of stock at the time of this writing. So it might be sold out soon. Only 32? Must be tough. KC is awesome, got my shipping notification at around 5pm. EST today. Love the PM2 Cruwear with the smooth G10, probably won't get hard use like my S110V EDC. How does one become a member of the Cruwear Nation?